It’s amazing how your brain works. Memories can be evoked in an instant when you least expect it. The colors of autumn. That’s what Oli’s beetroot and potato salad reminded me of. The cod fish reminded me of, well, being a New Englander, it reminded me of old Cape Cod. It’s lovely, open window weather in Virginia Beach and the evenings are just hinting at the cooler temperatures to come. When Oli sent me today’s recipes I was immediately transported back to fond memories of autumn in New England. It’s amazing what memories colors and a piece of fish can evoke. Fall foliage trips were an annual family affair, with dad driving the Kancamagus Highway through the White Mountains of New Hampshire and on to Franconia to visit the old man of the mountain – that rugged, craggy granite face produced by nature on the side of a mountain. The breathtaking colors of autumn in New England . . .
Fast forward to adult life in Boston and autumn trips to New Hampshire were replaced with weekend or day trips to Cape Cod. Warm sun, cool evenings, sand dunes, cranberry bogs, a steamy hot cup of Cape Cod clam chowder, no tourists. . .
It’s still pretty green in Virginia Beach, and it’s not quite cool enough to crave a hot mug of clam chowder. Although for me chowder is an anytime comfort food, somehow it’s most satisfying on a really cool autumn night. So, back to Oli’s recipes. Bright red beetroot, green spring onions, red tomatoes, dressed in a soft golden vinaigrette. 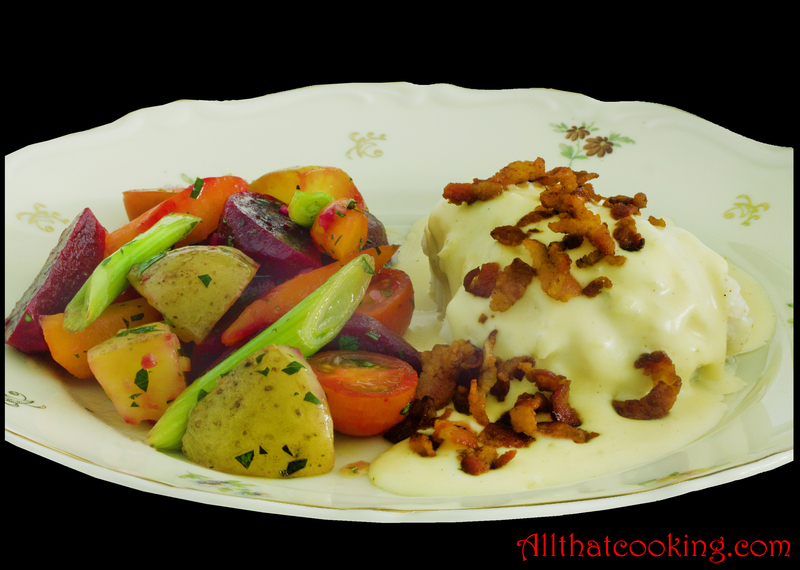 Dijon mustard in a delicate cream sauce complements and doesn’t at all overpower the delicate flavor of fresh cod. As for the bacon . . . who doesn’t love bacon? It does fantastic things to this fish dish by pulling together the softness of the fish and creaminess of the sauce. The flavors and textural contrast make your mouth say ahhhh, comfort food. This entire dish is a taste sensation. This meal requires a little timing so that everything is finished at about the same time. A. 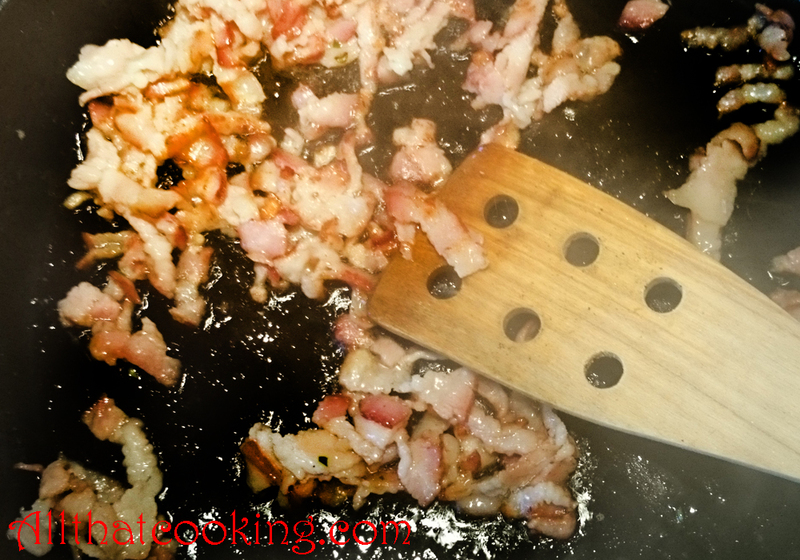 Start by frying up the bacon until nice and crispy. Drain on paper towels and reserve. B. While the salad veggies are cooking, make the vinaigrette. C. Make the sauce and when it’s half way done, start steaming the fish. 1. Cook the beetroots in plenty of simmering water until you can feel that they are soft in the middle when you poke them with a thin knife, about 20 minutes. When cool enough to handle cut into small wedges or 1-inch cubes. Reserve and keep warm. 2. Cook the potatoes the same way in a separate pot. They may be done before the beets so poke them sooner. When they are cool enough to handle cut into 1-inch cubes and place in medium size bowl and keep warm. 3. In a small saucepan add carrots to salted boiling water and cook for about 2 minutes. 4. At the last minute, toss in spring onions and cook for 1 more minute. Drain and add to potatoes. 5. Drop tomatoes into potato bowl and drizzle with half of the vinaigrette. Stir very gently to coat all of the vegetables. 6. Drizzle the other half of the vinaigrette over the beetroots and gently toss to evenly coat. Add beetroots to the rest of the salad and carefully toss to combine. 1. In a medium sauce pan cook onions in butter over medium high heat until translucent. 2. 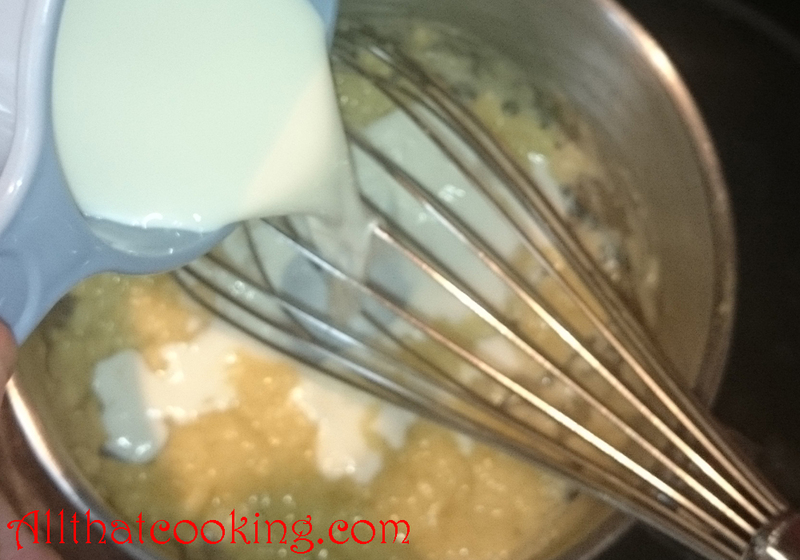 Add flour and whisk until smooth and well combined. 2. Slowly whisk in milk and cream. 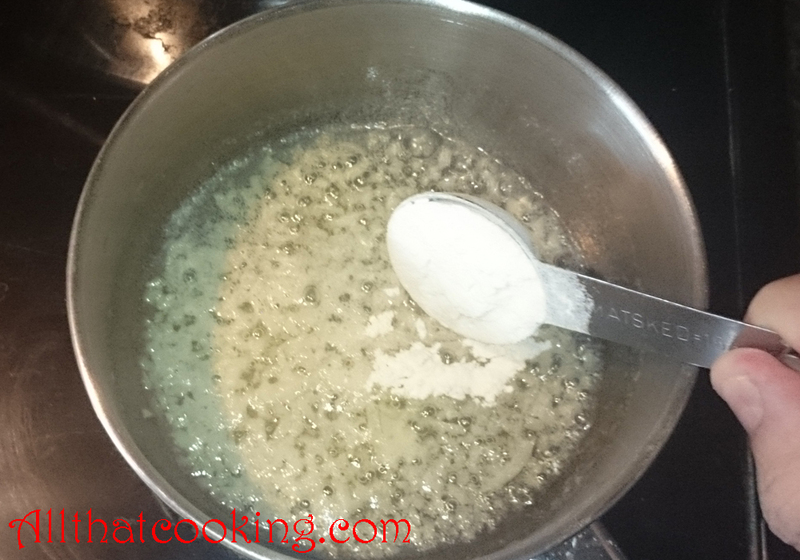 Sprinkle in white pepper to taste and drop in the fish stock cube. Bring to a boil over medium high heat while stirring. Add more cream or milk if it’s too thick. 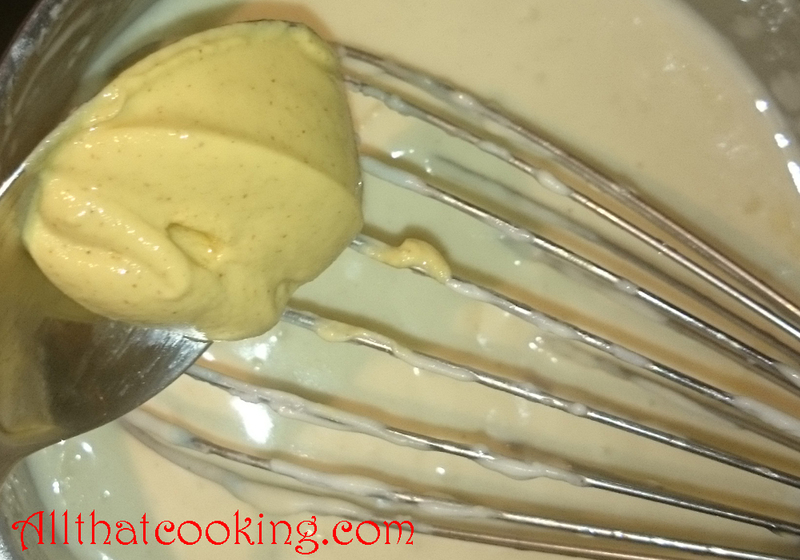 You want a consistency such that it easily coats a spoon when dipped into the sauce. Sort of thick but runny. Remove from heat, cover and keep warm. 1. Line the steamer basket with a sheet of buttered foil then arrange the fish on top. 3. 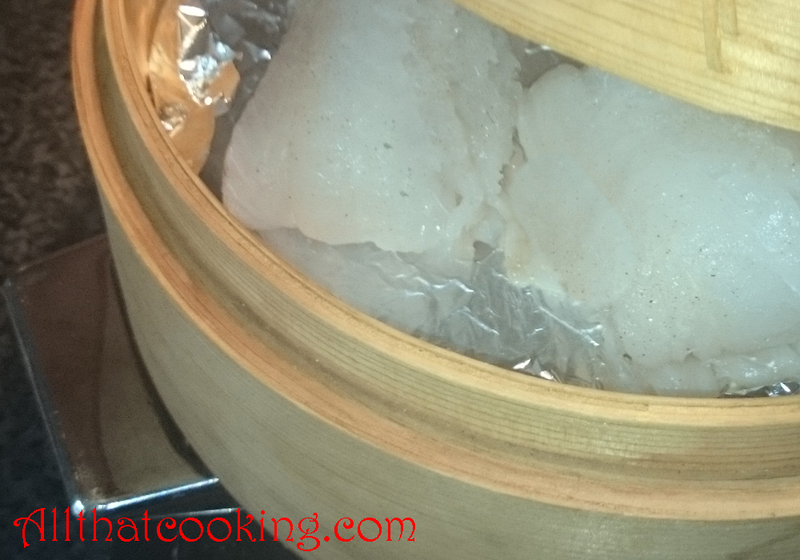 Place the steamer in a pan or wok that has at least 2-inches of water in the bottom. Water should not touch the fish. 4. Bring water to a simmer. 5. Steam for about 8 to 10 minutes, until the fillets are just opaque throughout. Just before you serve the fish bring sauce back to a boil and plop in the mustard. 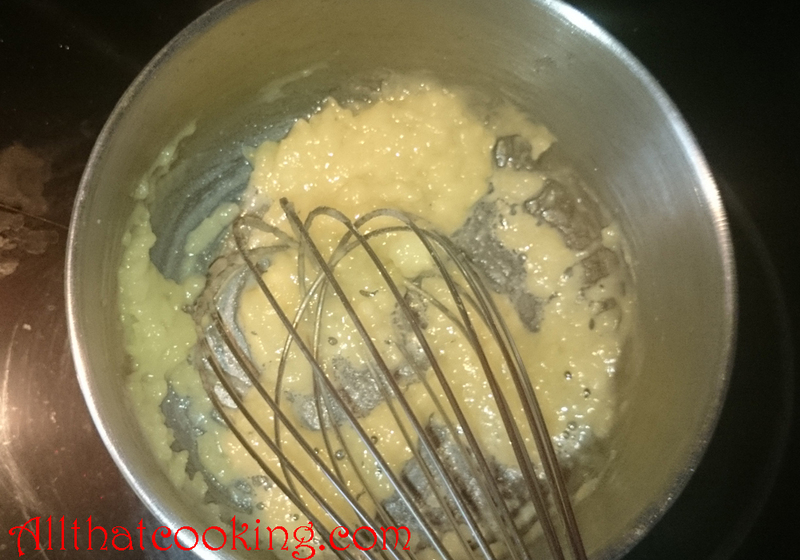 Immediately take pot off the heat and give it a stir or two with a whisk to mix in the mustard. Don’t boil after adding the mustard. Divide the fish and warm salad among four plates. Pour sauce over fish and finish the plate with bacon sprinkles. 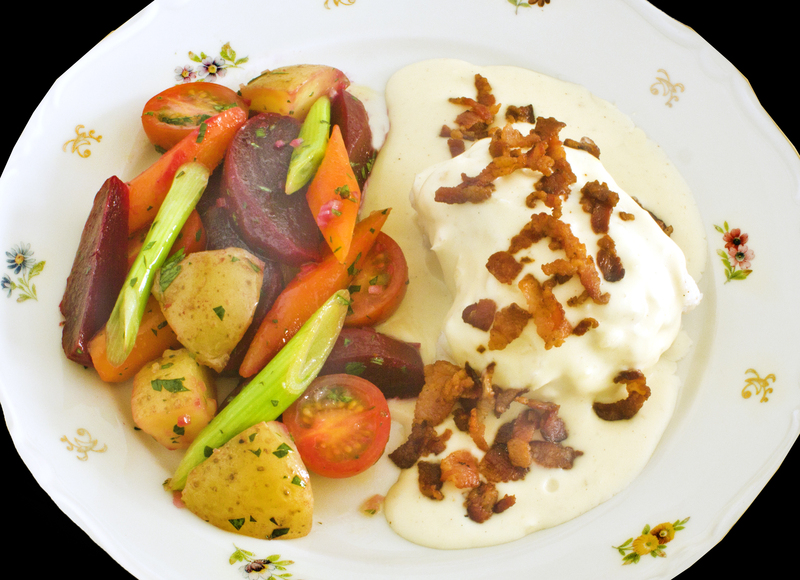 Gallery | This entry was posted in Main Dishes and tagged bacon, beetroot salad, Dijon cream sauce, steamed cod, warm autumn vegetable salad. Bookmark the permalink.